You're about to enjoy an incredible reading experience. 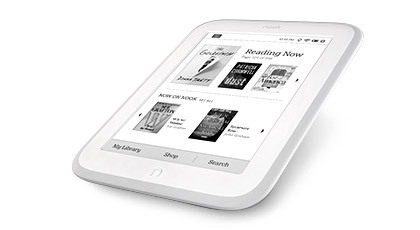 We'll help you set up your NOOK GlowLight in a few simple steps. You will need a BN.com account to register your new NOOK. If you do not already have a BN.com account, please create one. If you have an existing BN.com account, please be sure you have a default credit card and billing information saved in your account. To manage your credit card information, please sign-in to your account using the following link. You must charge your NOOK before using it for the first time. It takes approximately 4 hours to charge your NOOK from your computer using the USB Cable included with your NOOK. Turn on your NOOK by pressing and holding the power button on the left side of your device for about 2 seconds. Read the Welcome screen and tap Next. Select your Time Zone, then tap Next. Connect to Wi-Fi®. Connect automatically and for free at any Barnes & Noble bookstore and at any AT&T Wi-Fi hotspot in the U.S; or use your home Wi-Fi or other public Wi-Fi hotspot. Register your device by entering your BN.com account email and password. Check your inbox for a $5 credit to start shopping at the NOOK Store®. That's it. Have fun exploring your new NOOK.